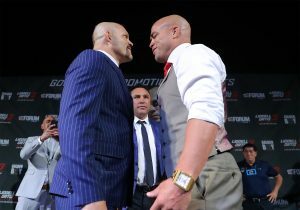 Chuck Liddell (30-8, 20 KOs) and Tito Ortiz (19-12-1, 8 KOs) hosted a pressconference today at the David Copperfield Theater at MGM Grand to formally announce their three-round main event on Saturday, Nov. 24 at the “Fabulous” Forum in Inglewood, California. The fight will be presented live on Pay-Per-View beginning at 6:00 p.m. PT/9:00 p.m. ET. Tickets for Liddell vs. Ortiz 3 are on sale now. Tickets are priced at $ 30, $ 50, $ 100, $ 150, $ 300, $ 500 and Ringside VIP $ 1,000. (Limited Number Ringside VIP Available Access To The Forum Club Included) Prices do not include applicable facility fees and service charges, with a total ticket limit of 12 per person. To charge by phone with a major credit card, call Ticketmaster at (800) 745-3000. Tickets will also be available for purchase at www.fabulousforum.com or www.ticketmaster.com, and also at the Forum Box Office.